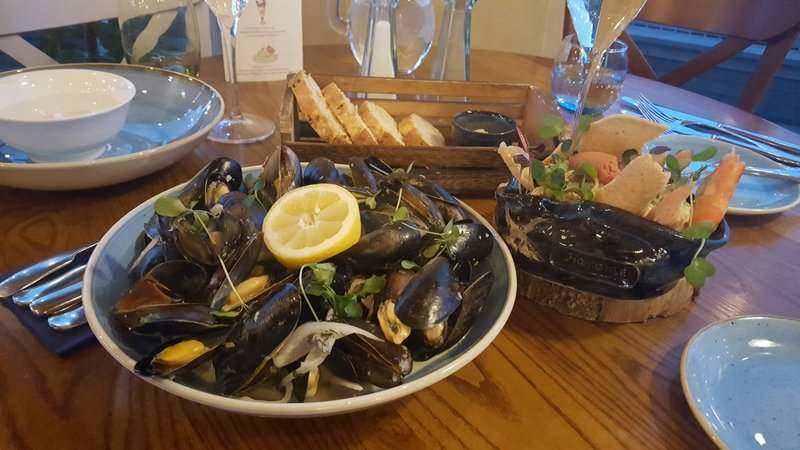 This week our intrepid blogger, Sara Harland, visited the new Andrew Pern restaurant, The Star Inn The Harbour. Here’s A Local’s Guide to The Star Inn the Harbour in Whitby. Having the Whitby area as your birth place and moving away for your career is something that some local people must do. But the sight of the Abbey, the sound of seagulls and scent of the sea air is something that you can never leave behind. This was certainly the case for Andrew Pern, the owner and head chef at The Star Inn The Harbour. Andrew, owner of three other successful restaurants, one being the Michelin starred, The Star Inn at Harome. is from the Whitby area, and was brought up in a local village just on the outskirts of Whitby. Andrew established his reputation as a Michelin starred chef with The Star Inn at Harome. This local chef discovered his passion for cooking by helping his mum in the kitchen when she developed MS. Local produce around him growing up has influenced Andrew ever since. From Andrew’s success with The Star Inn at Harome, he moved onto opening two restaurants in York, The Star in the City and Mr P’s Curious Tavern. With 22 years in the restaurant trade and winning the North East Final of 2011 Great British Menu, Andrew took the chance to develop the former Tourist Information Centre on Langborne Road into his latest venture. Andrew has put his stamp on this area of Whitby, making this building another Star restaurant attraction, making this seaside town a new influence on Yorkshire’s food scene. Family is another big theme and motivator for Andrew as his parents are regular visitors to the Star Inn the Harbour as they still live near Whitby. So, I thought I would bring my mum with me to review the Star Inn the Harbour. I have suddenly become very popular with friends, family and work colleagues since I have started reviewing restaurants for The Whitby Guide and my mum was on my list of dining partners to take. I phoned her up a week before we went to tell her that The Whitby Guide had organised for me to review the Star Inn the Harbour. The telephone conversation went like this, “Mum, would you like to come with me next Thursday to the Star Inn the Harbour?” My mum replied with this, “Yes, of course I would bairn, don’t make it too late though – I can’t eat late on at night.” This was followed by numerous phone calls leading up to the restaurant date about what she was going to wear and changing her mind on what starter and main course we were both going to have. Also, overnight she became a restaurant critic and has been giving me pointers on how to write this review. Once you enter the main area of this restaurant you are completely submerged in the nautical theme with modern twists that create that feeling of being beside the sea side; it’s a lot of fun, with one feature of a mounted plush toy donkey head on the wall with its teeth clenched holding a stick of seaside rock with a ‘kiss me quick’ hat perched on it head; the head is in encased in a Star Inn the harbour life ring buoy! The main brasserie area of this restaurant ceiling is covered in sails, thick ropes, crab pots and seafaring objects. You can even enjoy your fish and chips in booths decked out in timber with plenty of seaside memorabilia around you to take in whilst choosing from the menu that is spilt in two parts with dishes from the harbourside or from the countryside. Everything is finished to such a high standard, thanks in large part to the work of local craftsman such as James Godbold from Godbold Blacksmiths Ltd to handcraft bespoke octopus door handles for example. There is also a private dining room for you to experience being in an exclusive captains’ quarters for any special occasions to celebrate with family and friends. Our table was situated in the window area of the restaurant, so we could view the harbour and watch the fishing boats come in, with the Abbey and Church street as a backdrop. From our waiter’s suggestion we ordered a bottle of Muscat dry white wine to accompany our meal. My mum and I both ordered seafood dishes for our starters, so that we got to try some of these classic dishes with the Star twist. I had my favourite dish in the world, that I have every time it is on the menu anywhere I go – The stars version of Moules Marinere; headlined as ‘Steamed Shetland Mussels served in ‘Scarborough Fair’ with parsley, sage, rosemary and Thyme.’ I was presented with a huge bowl of this shellfish delight with a wedge of lemon, the flavour of mussels was strong, but the Scarborough Fair broth balanced this flavour out. My mums’ starter was a classic take on a prawn cocktail, ‘Posh Prawn and Oak Smoked-Salmon Cocktail, Bloody Mary sorbet and fresh horseradish.’ This came with an even more striking presentation style and my Mum was very impressed. Our main courses came from the countryside menu as we both chose meat dishes. I had ‘Pan-roast Beverley reared duck breast with poached Yorkshire rhubarb, anise carrot puree with candied orange traditional Yorkshire sauce’ and seasonal vegetables. The appearance of this meal was stunning with the whole meal arranged in a way so that the flavours were infused as you ate it. Even the seasonal vegetables came in a small pan with the traditional Yorkshire sauce on a wooden stump. My mum ordered what could be described as a Fred Flintstone style- ‘14oz Salt-aged T-Bone Steak with anchovy, caper and herb butter and skinny fries.’ This dish was huge, but my mum chose to have the butter separate to see if she liked this unusual butter. The Star Inn the Harbour accommodated this request and my mum found that this butter was not for her liking, but the rest of the meal was fantastic. Even though we had polished off our starters and main, we both found room to share some desserts. It is just standard for me to have sticky toffee pudding if it is on the menu and the Star Inn the Harbour’s did not disappoint with a delicious texture and the epic flavour combination of toffee and ginger ice cream. We also had a personalised The Whitby Guide brownie! We were totally spoilt, and the service was exceptional. There was one brilliant thing that struck a chord with myself and my mum; the whole layout of the building is totally wheelchair friendly, this was a very important factor for going out with my family for meals 12 years ago. My dad had developed Motor Neurone Disease and went into a wheelchair quite quickly and we had to choose family meals based on wheel chair accessibility. The Star Inn the Harbour has used to great advantage the excellent wheelchair access already in place since the days of the Tourist Information Centre, so this has helped this venue become different again – another strength in Andrew Pern’s trademark of being inclusive for everyone to experience the Star Inn the Harbour. I loved the food at The Star Inn The Harbour. The sense of theatre and fun that pour out of the interior – the décor of the restaurant is like being in an art gallery – make each mouthful a joy. The quality of the food and design quirks of the restaurant are the trademarks that have made Andrew’s name in the food world – his skill is in infusing the local area and its culture into the menu. The Star Inn The Harbour brings a different kind of dining experience to Whitby that won’t suit everyone’s food palate, some folks like their fish and chips wrapped in paper and with a strong breath of sea air on the pier, but for those seeking a delicious meal in a beautifully appointed restaurant with attentive and professional service, then The Star Inn The Harbour is a sensory delight which I feel will be a popular choice with locals and tourists alike. Have you tried the The Star In The Harbour in Whitby? How much of the seafood,meat and other produce is sourced from local Whitby business as this hasn’t been mentioned in the article above ? Thank you for your comment. You’d have to ask at the venue since this will vary according to seasonally availability of produce.